Gilbert Malcom Sproat : Canoe Riders of Vancouver Island, 1868. Smith, Elder and Co., London,1868. "Did native Americans surf ? Native Americans of north-west coast used to ride waves with skill and coolness." The initial quotations supplied by Herve had been considerably expanded here. 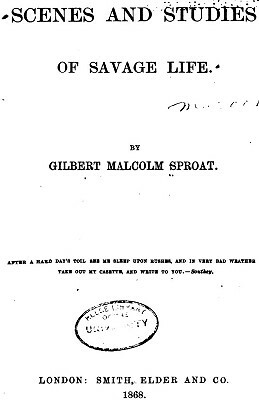 "Sproat was businessman, government agent, Indian reserve commissioner, magistrate, and author. His book is an examination of the Aht native tribe of Vancouver Island’s west coast, whom James Cook had called Nootka." In particular, Sproat had a strong interest in ethnology, as evidenced by the footnote on page 85, where he makes reference to his paper published in Transactions of the Ethnological Society in 1866. One hundred and fifty years before a theory of ancient coastal migration would gain some scientific credence, Spoat does not doubt "whether savages could cross in canoes from the Asiatic to the American shore." Bicho, Haws, and Davis (editors): Trekking the Shore- Changing Coastlines and the Antiquity of Coastal Settlement (2011). To the south of Vancouver Island, on 26th August 1912, the Tacoma Times reported a group of day-vistitors traveled on the Northern Pacific Railway to Moclips Beach in Washington where the various entertainments included "surf riding by the Quinalt (sic) Indians." rivers, estuaries, and the sea. 1815 Peter Corney : Hawai'i and Columbia River. 1835 Rev. Samuel Parker : Native Canoe at Columbia River. 1836 Washington Irving : Columbia River Canoes. Unfortunately, there appears to be no accounts of the maritime skills of the native inhabitants of California, their culture coming under severe pressure with the arrival of Spanish missionaries in 1697. By 1820 Spanish influence was marked by the chain of missions occupying a 25 mile wide coastal zone between Loreto, north to San Diego, to just north of today's San Francisco. -Wikipedia: History of California to 1899, viewed 14 June 2013. "Archaeological research has shown that San Miguel Island was first settled by humans at least 12,000 years ago, in the Millingstone Horizon archaeological period. Because the northern Channel Islands have not been connected to the adjacent mainland in recent geological history, the Paleo-Indians who first settled the island clearly had boats and other maritime technologies. Rough seas and risky landings did not daunt the Chumash people. They called the island Tuquan in the Chumash language, and for several centuries, they used plank-built canoes, called tomols, to reach their settlements." -Wikipedia: San Migel Island- History, viewed 14 June 2013. Herve also included the identification of Irving (1836), above, and attached two illustrations to his post. The first, W. de la Montagne Cary's Indian Canoe Race, published by Harper’s Weekly in 1874, illustrates a paddling-while-standing technique in bark-canoes.. 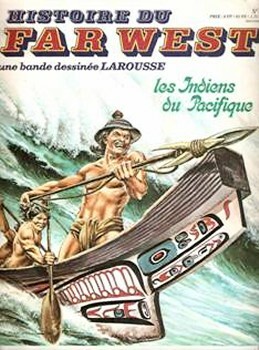 The second is Los Indians de Pacifique, drawn by G. D’Antonio for the cover of a French educative comic book, Histoire du Far West, published in 1982. In this fanciful represenation, a native prepares to launch his spear-harpoon while the crew ster the canoe on a considerable wave. During summer they are much in the open air, lightly clad, and in winter pass most of their time sitting round fires in a smoky atmosphere. All the natives swim well, but not so fast nor so lightly as Europeans; they labour more in the water. As divers they cannot be beaten; a friend of mine saw Maquilla, a noted warrior and fisherman of the Nitinahts, dive from the stern of a boat, in five fathoms of water, and bring up a pup seal in each hand from the bottom. On approaching the boat, one of the seals got away, but Maquilla, throwing the other into the boat, again dived and captured the seal before it could reach the bottom. [Footnote] * Throughout the year, though the climate on the whole is milder than the English climate, the water in the sea round Vancouver Island is colder than on any part of the shores of Great-Britain. I remember many instances of Indians having escaped from us through their skill in swimming, and paddling, and travelling through the woods. The management by a single Indian of a canoe in crossing a rapid stream cannot be surpassed. At the same time, I may observe that I have seen a trained crew of white men beat a crew of Indians in a long canoe race on the sea. The civilized man seems to have more bottom in him, when the exertion is intense and prolonged. [Footnote]* From some cause, perhaps the constant use of the paddle, their fingers are very strong ; as already stated, I have seen middle-sized natives carry heavy weights with their fingers which stalwart woodmen could scarcely lift. Canoes are made on this coast principally of cedar, and are well shaped, and managed with great skill by men, women, and children. They are moved by a single sail or by paddles, or in ascending shallow rapid streams, by long poles. I have seen an Indian boy with a single pole make good way with a small laden canoe against a stream that ran at the rate of six miles an hour. Canoes are of all sizes, but of a uniform general shape, from the war-canoe of forty feet long to the small dug-out in which children of four years old amuse themselves. seal-skin buoys to the sides of a canoe to prevent it from upsetting in heavy weather. The sail — of which it is supposed, but rather vaguely, that they got the idea from Meares some eighty years ago — * is a square mat tied at the top to a small stick or yard crossing a mast placed close to the bow. It is only useful in running before the wind in smooth water. The management of a canoe by natives in a heavy sea is dexterous ; they seem to accommodate themselves readily to every motion of their conveyance, and if an angry breaker threatens to roll over the canoe, they weaken its effect quickly by a horizontal cut with their paddles through the upper part of the breaker when it is within a foot of the gunwale. Their mode of landing on a beach through a surf shows skill and coolness. Approaching warily, the steersman of the canoe decides when to dash for the shore; sometimes quickly countermanding the movement, by strenuous exertion the canoe is paddled back. Twenty minutes may thus pass while another chance is awaited. At length the time comes ; the men give a strong stroke and rise to their feet as the canoe darts over the first roller ; now there is no returning : the second roller is just passed when the bowpaddler leaps out and pulls the canoe through the broken water ; but it is a question of moments : yet few accidents happen. The paddles used by the Ahts are from four to five feet long, and are made of crab-apple or yew. Two kinds are used ; the blade of one is shaped like a leaf, and the other tapers to a sharp point. [Footnote] * Would it be fanciful to connect their first notion of a canoe sail with their observation of the membranous fan of the pine-seed, which they often see floating through the air, in the forest, after falling from the cones ? paddle is suitable for steering, as it is easily turned under water. It was formerly used ag a weapon in canoe-fighting for putting out the eye — a disfigurement which many of the old Aht natives show. In taking a seat in a canoe, the paddler drops on his knees at the bottom, then turns his toes in, and sits down as it were on his heels. The paddle is grasped both in the middle and at the handle. To give a stroke and propel the canoe forward, the hand grasping the middle of the paddle draws the blade of the paddle backwards through the water, and the hand grasping the handle pushes the handle-end forward, and thus aids the other hand in making each stroke of the paddle : a sort of double-action movement. As a relief, the paddler occasionally shifts to the handle the hand grasping the middle of the paddle, and vice versa. 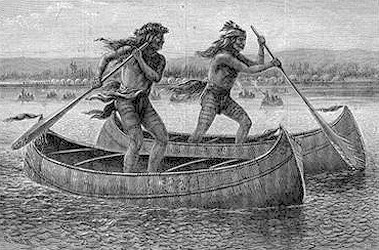 Such a position looks awkward, but two natives can easily paddle a middle-sized canoe forty miles on a summer day. The Indians paddle best with a little wind ahead ; when it is quite calm, they often stop to talk or look at objects in the water. [Footnote]* I read with surprise the doubtful opinions of ethnological writers as to whether savages could cross in canoes from the Asiatic to the American shore. The Aht natives, and particularly the bolder Northern Indians, could do so in such canoes as they now have without any difficulty. It is not easy to determine what motive could induce savages to undertake such a voyage, or to migrate at all over the sea. The hope of reaching a better country would not be likely to enter the mind of a savage. He would not move unless forced to move. one sits in the stern and the other in the bow. The middle is the seat of honour for persons of distinction. An Indian sitting in the stem can propel and steer a canoe with a single paddle. In crowded war-canoes the natives sit two abreast. No regular time is kept in the stroke of the paddles unless on grand occasions, when the canoes are formed in order, and all the paddles enter the water at once and are worked with regularity. The most skilful canoe-makers among the tribes are the Nitinahts and the Klah-oh-quahts. They make canoes for sale to other tribes. Many of these canoes are of the most accurate workmanship and perfect design — so much so that I have heard persons fond of such speculations say that the Indians must have acquired the art of making these beautiful vessels in some earlier civilized existence. But it is easy to see now, among the canoes owned by any tribe, nearly all the degrees of progress in skilful workmanship, from the rough tree to the well-formed canoe. Vancouver Island and the immediately opposite coast of the mainland of British Columbia have always supplied the numerous tribes to the northward with canoes. The native artificers in these locahties have in the cedar (Thuja gigantea) a wood which does not flourish so extensively to the north, and which is very suitable for their purpose, as it is of large growth, durable, and easily worked. Savages progress so slowly in the arts, that the absence of such a wood as cedar, and the necessity of fashioning canoes with imperfect implements from a hard wood like oak, as the ancient people of Scotland did, might make a diflference of many centuries in reaching a stated degree of skill in their construction. Page 86 MODE OF MAKING CANOES. The time for making canoes in the rough is during the cold weather in winter, and they are finished when the days lengthen and become warmer. Few natives are with-out canoes of some sort, which have been made by themselves, or been worked for, or obtained by barter. The condition of the canoe, like an Englishman's equipage, generally shows the circumstances of the possessor. Selecting a good tree not far from the water, the Indian cuts it down laboriously with an axe, makes it of the required length, then splitting the trunk with wedges into two pieces, he chooses the best piece for his intended canoe. If it is winter, the bark is stripped and the block of wood is dragged to the encampment ; but in summer it is hollowed out, though not finished, in the forest. English or American tools can now be easily procured by the natives. The axe used formerly in felling the largest tree, — which they did without the use of fire — was made of elkhorn, and was shaped like a chisel. The making of a canoe takes less time than has been supposed. With the assistance of another native in felling and splitting the tree, a good workman can roughly finish a canoe of fifteen or twenty feet long in about three weeks. Fire is not much used here in the hollowing of canoes, but the outside is always scorched to prevent sun-rents and damage from insects. into it, and the canoe, thus softened by the heat, is, by means of cross-pieces of wood, made into a shape which, on cooling, it retains. The fashioning is done entirely by the eye, and is surprisingly exact. In nine cases out of ten, a line drawn from the middle of the extremities will leave, as nearly as possible, the same width all along on each side of the line. about four feet apart, and there remain. The gunwale is turned outwards a little to throw off the water. according to the capabilities of the tree and the fancy or skill of the maker. Red is the favourite colour for the inside of a canoe, and is made by a mixture of resin, oil, and urine ; the outside is as black as oil and burnt wood will make it ; the bow and stern generally bear some device in red. The natural colour of the wood is, however, often allowed to remain. The baling-dish of the canoes is always of one shape — the shape of the gable-roof of a cottage — and is well suited to its purpose. reduplication), is " to kick frequently." Yetseh-yet-sokleh, undoubtedly from the same root, is a " screw steamer." When the natives first saw one of these vessels, noticing the disturbance of the water astern, they attributed the propulsion to some action analogous to the stroke of the legs of a swimmer, and so the name of "continual kicker" was at once invented and universally received. Los Indians du Pacifique, 1982. Cover of a French educative comic book, Histoire du Far West. Geoff Cater (2013) : Gilbert Malcom Sproat : Canoe Riders of Vancouver Island, 1868.